Story Outline: The Carter family are crossing the desert wastes of America heading for California when they are attacked by a group of savage cannibals. Mr Carter is crucified, filled with petrol and set on fire. Mrs Carter is shot in the stomach and left for dead. Her daughter is raped and her baby taken for the savages food pot. For the rest of the Carter family it is now a battle of survival. With the aid of their Alsatian dogs, the Carter family start to turn the tables and reverting to their own primitive instincts, they start to wipe out the cannibal punks. The lucky ones die first. 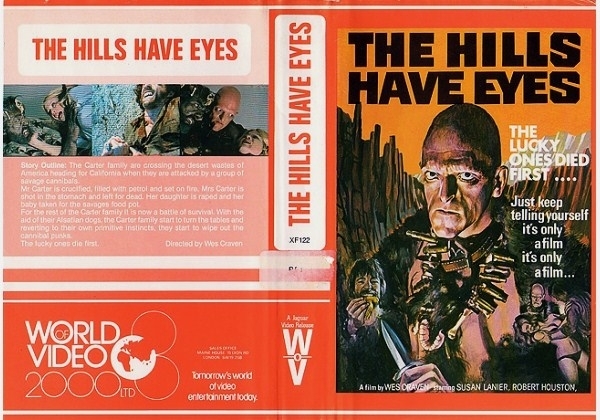 Or find "Hills Have Eyes, The" on VHS and DVD / BluRay at Amazon.